After a long day at work, there is nothing better for your body and mind than a spa visit. However, as the cold weather is coming, most of you would rather skip the pricey trip and would prefer to stay warm at home. 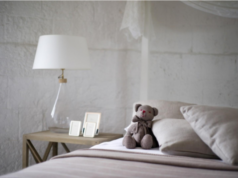 Given that the sunless winter weather can soak your energy and make you feel depressed, you need a soothing sanctuary in your own home. You have the power to create one with little to no effort, in your own home. A calm, soothing atmosphere animated by ambient light, pastel colors, wooden textures of various kinds and plants, are just some of the ingredients of an extraordinarily successful recipe that you can prove that works in your bathroom at home. As the most relaxing room in our homes, a well designed bathroom can simple erase the stress gathered throughout the day and induce peace and tranquility. It can simply make wonders for your body and mind. Getting the benefits of a spa treatment in your own home is not as hard as you think. With just a few renovations and additions, you can immediately turn your bathroom into a private oasis, an actual spa in your very own home, even if it is not so spacious. Accept some of these 17 ideas that can immediately turn your bathroom into a private oasis at home, and enjoy the feeling of relaxation and calmness. There are many possible ways how to create a spa feel in your bathroom. Use wooden textures as accents to add coziness and warmth. 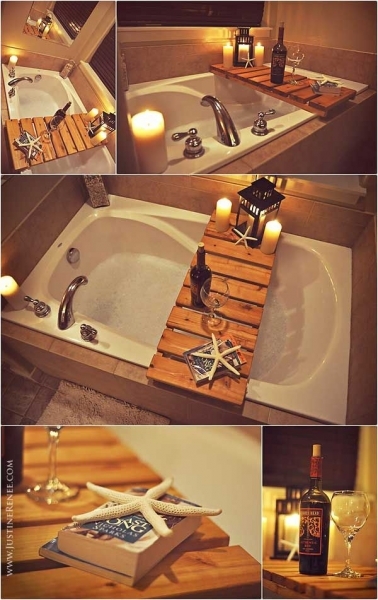 You can even add outdoor wooden floor to your shower floor. You can also create low wooden shelves to accommodate candles and towels, or the wooden shelves can also be built into the wall and can represent a very stylish detail. Use homemade bathroom salts and floating candles to add peace and tranquility to your sanctuary. Pebble candles can create surprisingly good and relaxing atmosphere. 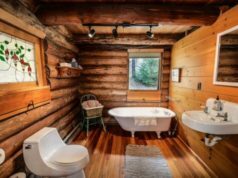 Fortunately, you don’t need a spacious bathroom to install a jacuzzi or sauna. In fact, what makes a spa feel relaxing is not those fancy features, but the soothing appeal, smell and sound. Candles, wine and the favorite book sounds like the perfect combination for relaxation and a real spa treatment.